The Gawler Bowling Club is indeed fortunate to have had over the years some members who had the foresight to keep minute books and photos. The Club has the complete set of minute books dating back to the first official meeting on13th June 1907. Also, on hand, is a huge photo albumn with photos dating back to Opening Day on Wednesday 12th February 1908. I would like to sincerely thank Bruce Eastick and Glad and Arthur Cliff for providing me with some fascinating details about the club history and recounting some of the more colourful moments minuted throughout the archives. The following history of the club is not meant to be a detailed account but instead some important occasions representing the history of the Gawler Bowling Club set out in dot points. 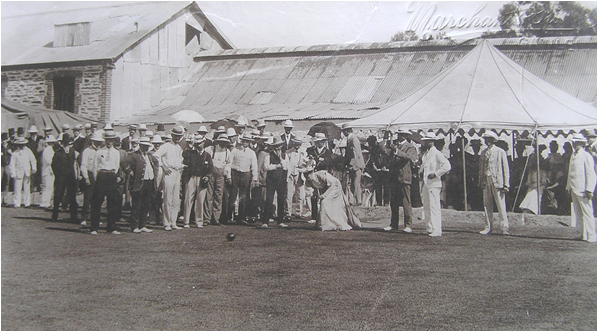 21st March 1907 – Meeting of interested parties in the formation of a Gawler Bowling Club. 13th June 1907 – 1st official meeting of 7 board members. First task was to lease or purchase land for Bowling Club site. 3rd July 1907 – Late James Martin Trustees gave an allotment of land on corner of Jacob and Reid Streets for 10 years @ £5 per annum. 10th August 1907 – A 5 rink green laid out on allotted land. 31st January 1908 – Decided Opening Day to be on Wednesday 12th February 1908. 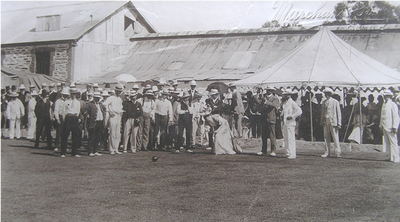 12th February 1908 – Opening Day of the Gawler Bowling Club. Opened by a Mr Jacobs from the Royal South Australian Bowling Association. He then placed the jack and the first bowl was rolled by the President’s wife Mrs A Smith. March 1908 – It was decided that Gawler Bowling Club’s colours would be dark blue coat with red and silver facings and a red and silver band for the hat. 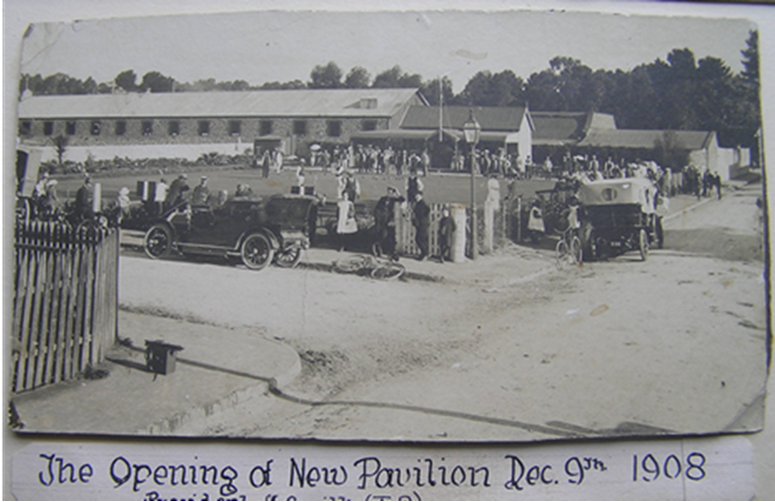 September 1908 – Decision was made to erect a Pavilion on site. 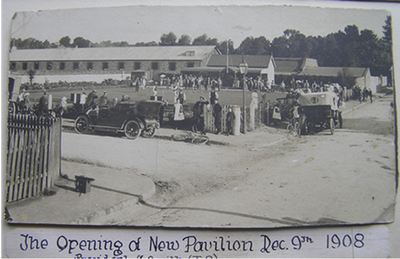 9th December 1908 – Pavilion opened. ( See photo below) Pavilion built on the basis of £1 debentures (loan) from club members. 13th September 1910 – At the AGM it was decided to purchase allotment of land from James Martin Trustees at a cost of £105. 4th September 1912 – Agreed to join Adelaide Bowling Association. 17th July 1913 – Decided to enter team in B grade. August 1913 – Connected to Electric Light. 18th July 1914 – Membership not to exceed 75 members. 2nd July 1917 – Seek use of vacant land behind the fire brigade. (next door to Bowling Club) This land to be leased for the provision of a croquet court to be used by the wife, daughter or sister of Club Members. 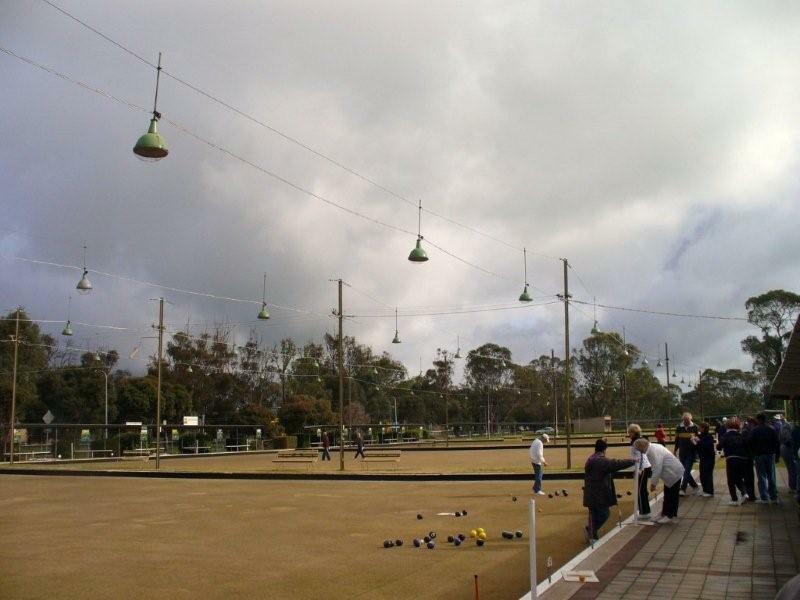 1952 – Gawler Ladies Bowling Club formed. Permission sought and accepted to play in Wooroora Association. 10th April 1959 – All business and finances in connection of Club to do so with the view of Club moving location. 21st August 1959 – site referred to as new playing area. 23rd September 1959 – 1st work on new site commenced with local tractor driver leveling and chiseling the area. Greens to be squared and pegged. 9th November 1959 – To finance new clubrooms a donation of £250 entitled a member to full membership for life with privileges. Debentures were offered at 4% interest where possible to be paid back over a period of 10 years at one tenth per annum. 24th February 1961 – Council refused to pay £3250 for the original site of Gawler Bowling Club. 21st June 1961 – Members accepted a final price of £6186 for building of new clubhouse. Builder being C T Duldig. 30th August 1961 – New greens to be numbered 1 – 21. (3 greens of 7 rinks). 14th October 1961 – Essex Park Greens opened. 14th July 1965 – At the AGM a motion to join Wooroora Association lapsed when there was no seconder. 16th November 1966 – Decision to travel to Pennant matches by bus was accepted. 21st March 1974 – Decision made to procure extra land for additional green. Group to look at possible extensions to Clubrooms. 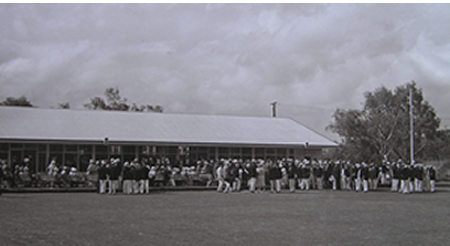 1984 – Extension to clubrooms. 8th September 1984 – Club noted the passing of Frank Congdon. 13th October 1984 – Ross Davis to seek permission from Kath (wife of Frank) to name the new lounge the Frank Congdon Lounge. 2nd December 1984 – New extension opened by President of RSABA. Cliff Hooper, Club President, opened the Frank Congdon Lounge. 1985 – Clubroom extension cost $185,634.00. $107,491.00 came from Commonwealth Government Employment Scheme grant, $7,387.00 Ladies Club contribution and $70,756.00 from Mens Club contribution. 2000 – 2003 – Replanting of all greens from Santa-Anna to Tift-dwarf couch. 6th November 2002 – Gawler Ladies Bowling Club celebrate their 50th Anniversary with South Australia’s Governor Marjorie Jackson special guest. 18th March 2007 – Gawler Bowling Club’s Centenary Dinner.